Governments throughout the vast majority of history have abused individual liberty and ignored basic safeguards like due process and habeas corpus. a bill of rights [should provide] clearly and without the aid of sophisms for… the eternal and unremitting force of the habeas corpus laws, and trials by jury in all matters of fact triable by the laws of the land and not by the law of nations. 803 years after the signing of the Magna Carta and 242 years after the signing of the U.S Declaration of Independence, these cornerstones of liberty remain under attack from government officials that would gladly trade liberty for a false security. On this anniversary of the Magna Carta, Senator Lindsey Graham of South Carolina objected again (for the sixth year in a row) to even allowing a vote on the repeal or amendment to sections 1021 and 1022 in the 2012 NDAA(National Defense Authorization Act). These sections allow for the indefinite detention and the potential assassination of any person without any due process. The vaguely worded provisions use the war on terror to classify U.S. citizens and any suspected person as a potential “enemy combatant” under the “laws of war.” With no end in sight for the “war on terror,” these provisions allow for the abuse of any person’s right to due process. 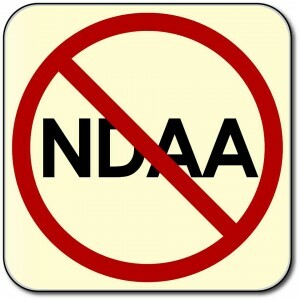 While the NDAA is an annual defense appropriations bill, in recent times it has been used as an omnibus vehicle for unconstitutional usurpations with dangerous provisions similar to the (unpatriotic) PATRIOT ACT. In all capital or criminal prosecutions a man hath a right to demand the cause and nature of his accusation to be confronted with the accusers and witnesses, to call for evidence in his favor, and to a speedy trial by an impartial jury of his vicinage, without whose unanimous consent he cannot be found guilty, nor can he be compelled to give evidence against himself; that no man be deprived of his liberty except by the law of the land or the judgement of his peers. The unconstitutional indefinite detention provisions of the 2012 NDAA are based on authority granted for use of military force (AUMF) for use in Iraq and Afghanistan, sections 1021 and 1022 opened the door for the United States to be treated as a “battlefield” and allow the government to indefinitely detain and imprison any person by only accusations or suspicions of a crime without due process or trial by jury. This is dangerous to liberty. Jefferson also wrote in 1798 to A. H. Rowen stating, “The Habeas Corpus secures every man here, alien or citizen, against everything which is not law, whatever shape it may assume.” This reaffirmed the idea of “unalienable rights” which applies to all people by the laws of nature. Governments throughout the vast majority of history have abused individual liberty and ignored basic safeguards like due process and habeas corpus. In the grand scheme of history, liberty is still young. The means of defense against foreign danger, have been always the instruments of tyranny at home. Among the Romans it was a standing maxim to excite a war, whenever a revolt was apprehended. Throughout all Europe, the armies kept up under the pretext of defending, have enslaved the people. 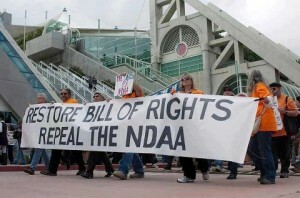 The indefinite detention provisions of the 2012 NDAA have the potential to be abused. These provisions essentially give government the ability to detain without trial or allowing for due process. This sets a very dangerous precedent of removing the burden of proof from the state.